Bass Clubs... You Asked For It!! The MS-30 is the sister to the popular MS-40. It has a 30 lb. capacity and weighs in pounds & ounces and in pounds & hundredths. Features a "Hold" button to lock the weight on the screen. Also has a "Tare" feature. Runs on a 9 volt battery (not included). Optional 12 volt adapter w/10 ft. cord available. With a 40 lb. weight capacity, this scale weighs to within 1/100th of a lb. Fast to use, the MS-40 zeros in just one second. Great for tournament weigh-ins! The 12 Volt adapter is optional. 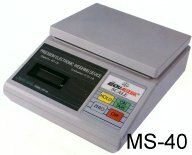 Refurbished Equalizer Scales For Sale! We have a large selection of refurbished Equalizer Scales available for purchase. These scales have been completely reconditioned and come with a 6 month warranty. If you're looking for a backup scale or a way to save money on your primary tournament scale, this is it. The Equalizer remote display is an optional accessory that can be purchased separately and is available in 4 sizes. The small and mid-sized models are powered by the scale, while the large size includes a 110 volt adapter. All models come with a 10 foot cord. An optional 15 foot cord will give you a total of 25 feet! The newest 5 x 11 inch display features individual LED lights that increase the distance from which it can be seen and give you better visibility from different angles. Display sizes listed are actual text size. Actual unit will be larger. Pictured to the left is the remote display with extra large 7 x 24 inch digits. Comes with a 15 foot cord and 12 Volt adapter. An optional 10 foot cord will give you a total of 25 feet! An optional 110 volt adapter is also available. All orders add $35.00 shipping & handling for each scale. Arizona residents only, add 5.75% sales tax. and be sure to mention that you saw our web site! May not be used without permission.